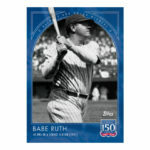 Three new cards have been added to the Topps 150 Years of Baseball series of on-demand baseball cards. This week's additions commemorate milestones by Dwight Gooden, Rickey Henderson, and Johnny Bench and are available for purchase for one week only. The complete checklist for this series can be found by clicking the main hub tab at the top of this page. This week's checklist is below. Clicking on the player's name will direct you to the purchase page. 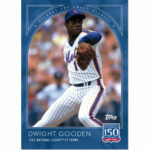 13 - Dwight Gooden (New York Mets) This week's "Records and Award Winners" card commemorates Gooden's 1985 Cy Young award. 1985 was the 20 year old's second season with the Mets (he finished second in Cy Young voting the year before) and he pitched in 35 games with a 24-4 record. Over 276.2 innings, Gooden threw 16 complete games and eight shutouts with an ERA of 1.53, a WHIP of 0.965, an HR9 of 0.4, and a SO9 of 8.7. The 1985 season was his second of four All Star years and he would place in the top 10 for Cy Young votes five times, all with the Mets. 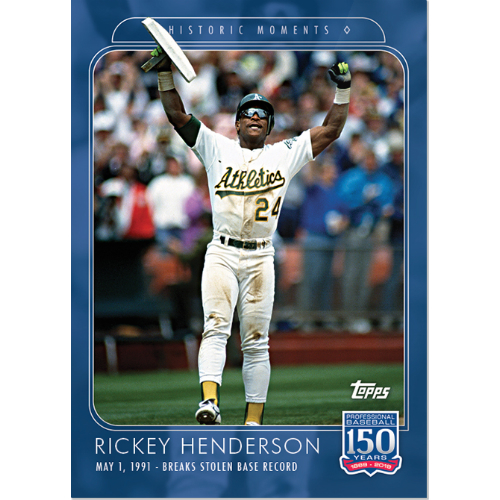 14 - Rickey Henderson (Oakland Athletics) This week's "Historic Moments" card honors one of the most iconic moments in baseball history when, on May 1, 1991, Rickey Henderson broke the stolen base record. The Man of Steal made history with his 939th stolen base but he would ultimately ensure his permanence at the top of the list by adding 467 stolen bags (1406) to his resume over the remainder of his 25 year career. The closest active player to the record is Rajai Davis who, ranked at 66, is just shy of 1000 stolen bases away. 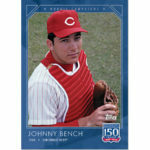 15 - Johnny Bench (Cincinnati Reds) Bench's first year in the majors is this week's "Rookie Campaigns" card. 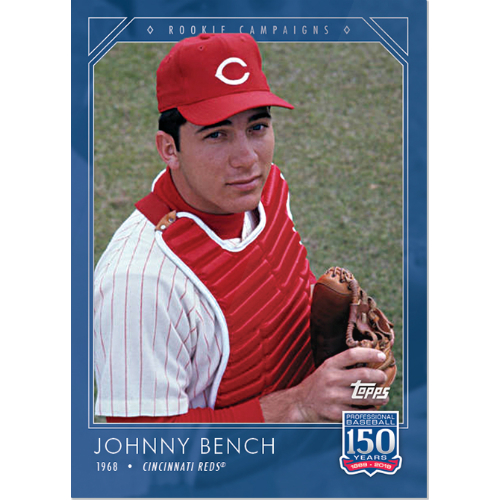 1968, the first full season of his 17 year career with the Reds, saw him post a .275/.311/.433 batting line with 15 home runs and 82 RBI. At the plate he provided a 4.6 oWAR and 21 RAA. 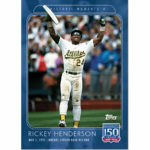 The 1968 Rookie of the Year also won his first of 10 Gold Gloves and appeared in his first of 14 All Star games. He would ultimately win two MVP awards, too. All three cards will be available for purchase until April 9, 2019 and can be purchased individually or as a bundle of three.